Matt’s entry in the Open 7400 Logic competition: Discrete logic POV clock. This persistence-of-vision clock was built entirely out of discrete logic chips. 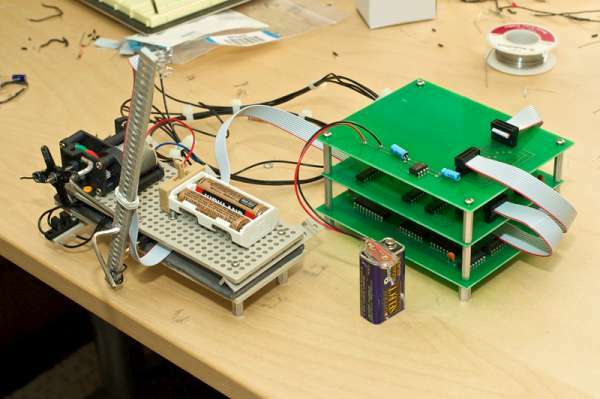 The design consists of three boards, a LED array and a drive motor. The digit board keeps the time while the display board controls the LEDs. Every second, a pulse increments the value stored in a counter. When it overflows, the next counter is incremented. Each counter represents a digit in the time. A decoder selects one digit at a time and puts that digit’s value on the output bus. A pulse from an external source wakes up the display board. It selects the leftmost digit from the digit board, formats it for a 7-segment-display, and chops up the result into a 5 x 5 pixel matrix. It lights up LEDs for each column in sequence then selects the next digit to the right. This entry was posted on Wednesday, October 5th, 2011 at 6:00 pm	and is filed under 7400 contest, POV Toy. You can follow any responses to this entry through the RSS 2.0 feed. You can skip to the end and leave a response. Pinging is currently not allowed. Cool project man, well done! Thanks Arthur! It was a great learning experience.